Zookeepers and animal health staff wheel Vip out of the zoo's animal hospital after the surgery is completed. Photo by Jeremy Dwyer-Lindgren/Woodland Park Zoo. Last week, we asked for your best wishes for western lowland gorilla Vip, who has been battling a severe sinus infection. After last week’s CT scan and a critical surgery this week to treat his chronic sinus infection, the 35-year-old silverback is successfully breathing through his nose for the first time in weeks! Vip is steadily improving, and for now he is spending time behind the scenes at the gorilla exhibit, getting some extra TLC from his keepers. A peek through the door of the operating room at Woodland Park Zoo's animal hospital. Photo by Jeremy Dwyer-Lindgren/Woodland Park Zoo. 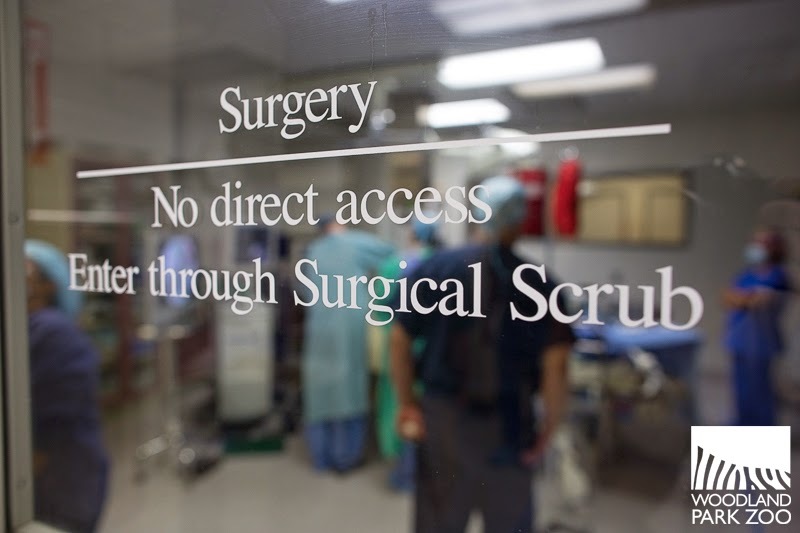 After the CT scan confirmed a complicated sinus infection, we realized the 425-pound patient would require sinus surgery to drain the blockage and physically remove the majority of the infection. 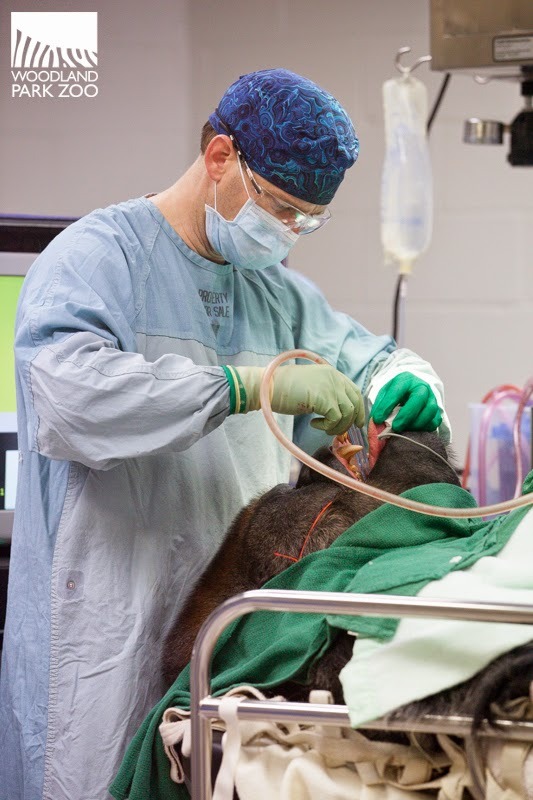 Although endoscopic sinus surgery is one of the most common procedures performed by physicians, it is rarely used in zoo medicine. University of Washington's Dr. Greg Davis leads the surgery on Vip at the zoo's animal hospital. Photo by Jeremy Dwyer-Lindgren/Woodland Park Zoo. 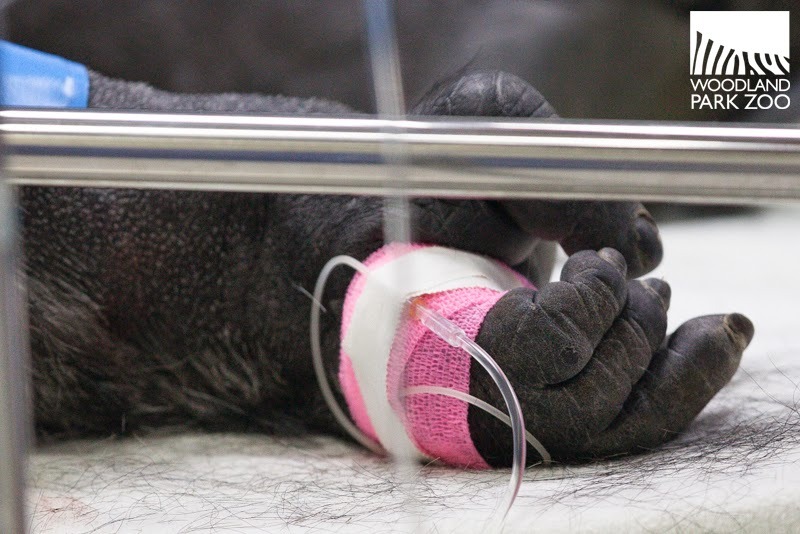 The procedure was successful and Dr. Darin Collins, the zoo’s Director of Animal Health, tells us he’s optimistic for a full recovery by Vip over the next few weeks. Back with his keepers now, Vip is eating well, venturing outdoors in a behind-the-scenes exhibit and breathing much more freely. These are all very encouraging signs and we’ll continue to monitor him closely. 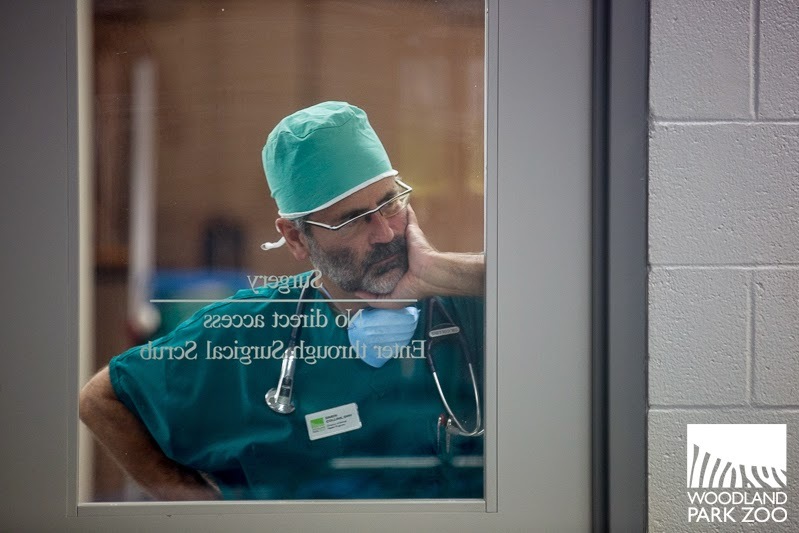 Woodland Park Zoo veterinarian, Dr. Darin Collins, looks in on the patient. Photo by Jeremy Dwyer-Lindgren/Woodland Park Zoo. We’re indebted to quite a few people for graciously volunteering their time and resources to make Vip’s CT scan and surgery possible. Dr. Collins and the zoo’s animal health staff worked alongside Robert M. Liddell, M.D. of Center for Diagnostic Imaging during Vip’s CT scan and specialist physicians, led by Greg Davis, M.D., M.P.H., University of Washington associate professor of otolaryngology – head and neck surgery and Director of Rhinology and Endoscopic Skull Base Surgery. Davis and Al Hillel, M.D., collaborated with Liddell and Woodland Park Zoo to provide the best possible patient care for Vip, with necessary medical and surgical equipment donated by Medtronic Navigation, Inc. and Storz Endoscopy. 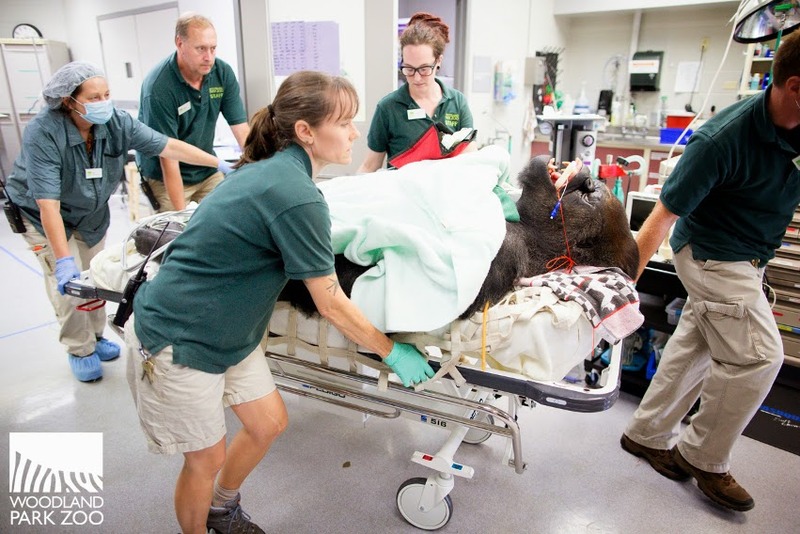 Davis and his surgical team performed the surgical procedure at Woodland Park Zoo’s animal hospital. Medical support and specialization from Liddell and the UW physicians were provided in-kind through an on-going partnership with the zoo. The 425-pound patient. Photo by Jeremy Dwyer-Lindgren/Woodland Park Zoo. Dr. Davis tells us the patient outcomes following surgery were positive beyond his expectations. “It is gratifying to know the animals at Woodland Park Zoo have such caring and compassionate professional animal care staff. It was an honor to work with this magnificent patient,” added Davis. We can't wait to see Vip back with his group and active again. Photo by Ryan Hawk/Woodland Park Zoo. Vip has a ways to go yet, but things are looking good for the Very Important Primate. 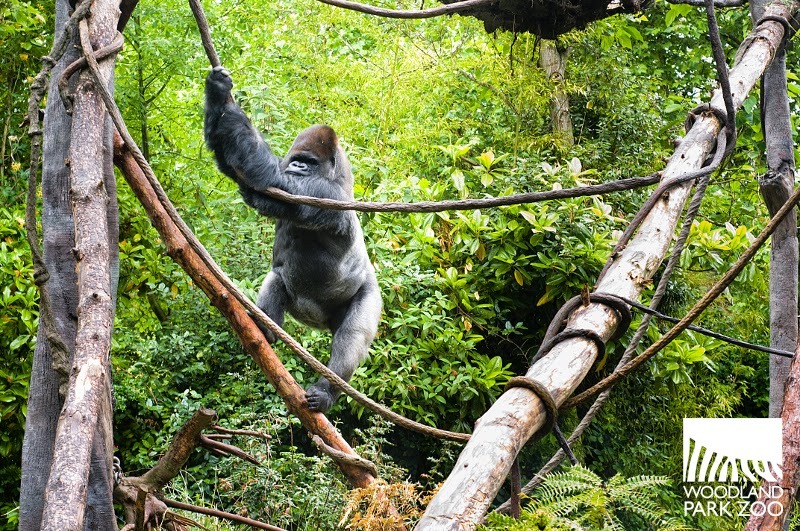 We’re hoping to see him back with his girls in the near future, leading the group and acting as peacekeeper once again for daughters Calaya and Uzumma and adult mates Amanda and Jumoke. Thanks to you all for your well wishes, and let’s keep the positive vibes going for our big guy! I am hoping for a speedy recovery vip! Wonderful photos Jeremy Dwyer-Lindgren -- you really captured this story. Please keep us updated on Vip's progress. Thanks to all the generous medical personnel in our community that donated their services! I hope all of you enjoy telling your stories of operating on a gorilla! I am glad to hear that the gorilla is healthy now. I like gorillas. MyZoo kids rocked the Animal Observation contest! Welcome Dhirin, our new male snow leopard! Which orangutan are you? Take the quiz!